Being a coach is a deeply rewarding profession, but even the best coaches encounter moments of uncertainty and doubt. 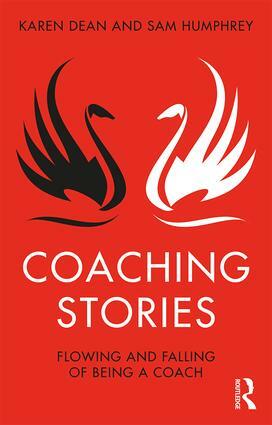 In Coaching Stories: Flowing and Falling of Being a Coach, Karen Dean and Sam Humphrey intimately share their varied experiences as executive coaches in 48 stories – some where they were flowing and glorious, and others where they were falling and ashamed. Dean and Humphrey guide the reader through the journey from a novice to a master coach by exploring twelve distinct themes, underpinned by the four parts of Dean’s ‘Exceptional Achievement’ framework: setting out, doing, integrating and being. Each chapter focuses on a different theme, presenting specific examples and stories from the authors’ work and reflecting on their learning and development at each point. Dean and Humphrey expertly assess topics, including confidence, talent, purpose and fulfilment, by examining times where they performed effectively as well as those where they fell short. In each case they consider what they wish they had asked or known about in advance, and each story provides an insightful look at what being a coach is really like. Practical and accessible, the book concludes with a section on further reading and study, explaining relevant theories, models and frameworks. Coaching Stories: Flowing and Falling of Being a Coach will be a compassionate and pragmatic companion for coaches of all kinds, both in practice and in training. It will also be a valuable guide for other professionals seeking development, including internal coaches, managers in a coaching role, HR and L&D professionals and will be a useful text for academics and students of coaching and coaching psychology. Dean and Humphrey are award-winning authors and have written a number of articles for leading coaching publications.